Much of the confusion about the ongoing privacy wars online comes down to consumer ignorance on the matter. The Internet Advertising Bureau is hoping to change that with the campaign that launched today — set to reach every American online. But even confronted with the details of online advertising, will consumers listen? explicit consent before using any of their personal information. But companies that use targeting have repeatedly argued that they need to follow consumer behavior online to make advertising more useful to consumers. And now they’re going directly to consumers to show how. 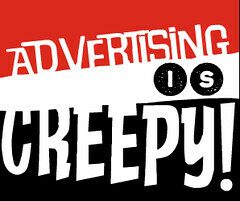 “Advertising is creepy” and “Hey, this banner can tell where you live. Users that click through the ads and on the IAB’s Privacy Matters page, which contains information on targeting, different kinds of advertising and cookies. combined 500 million impressions for the initiative. The ads are part of an ongoing campaign by the online advertising industry to inform consumers about how their private information is actually used online. When consumers — and legislators — hear talk about user information being used online, they often respond negatively without listening to the details of how it works — or how they can benefit from advertisers knowing some of their demographic data and browsing history. Lots of advertising companies argue that they use targeting in legitimate ways and are tired of being lumped together with internet scams, spam, spyware and malware whenever the subject of privacy comes up. But there are plenty of privacy advocates that think advertisers aren’t sharing the whole story. But even if the information is correct, an all-out campaign to inform consumers has no guarantee of actually reaching them. A test of the campaign in late October and early November yielded a click-through rate of 0.5%. Many consumers have shown through their browsing history that they don’t care to read the fine print — and even bold print — about their personal privacy. That’s why the movement for legislation has been gaining steam. If consumers don’t take the time to make decisions about their personal privacy, the argument goes, then Congress will have to do it for them. The advertising industry believes that when consumers are informed about the legitimate ways their information is used online, they will be comfortable with sharing. But unfortunately for online advertisers, there’s no guarantee consumers will read the details. One of the interesting things about The Wall Street Journal’s paywall is that it lets Google searchers view The Journal’s subscription content for free. But that isn’t likely to continue. Rupert Murdoch has been sounding the alarm about charging for News Corp. content. And today Google made a change to its search program that will put an end to freeloaders who use Google search as an endless free pass to WSJ.com. wall. But now users who click on more than five articles from a publisher in a day will see a “registration page” — in efforts to get potentional subscribers to poney up for content. That should help News Corp. wring a few extra dollars out of frequent Wall Street Journal readers. Too bad that’s not what Murdoch is concerned with at this point.